Just over a week ago I wouldn’t have believed you if you told me that I would be raving over a thermostat, but that’s exactly what I’ve been doing since I heard about Nest. 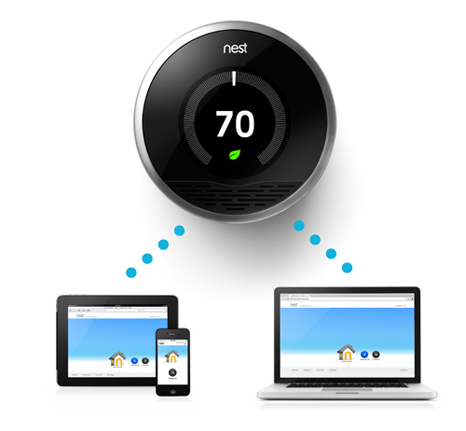 Nest, dubbed “the learning thermostat”, is probably one of the coolest gadgets (or hottest?) gadgets I’ve heard in quite a while. Sure, there are plenty of mobile devices that excite me, but the fact is that the demand for these mobile devices is such that you will see cool features left and right. Thermostats though are devices that seem to be stuck in time. This is perhaps one of the reasons why a new thermostat that smacks of innovation excites the geek in me; but enough about why I like the idea of an learning thermostat, and on to what it is exactly that makes this thermostat super cool. Nest is called the learning thermostat not just for marketing purposes, but because it learns about your habits and preferences and is able to put the data it gathers into good use allowing you to save much on electricity. “Teaching” Nest to learn your habits is, however, no big deal since all you need to do is install it, answer a few basic questions (i.e. Should Nest start heating or cooling your home? ), and then leave it alone to do the “learning” all by itself. Within a week, Nest should have come up with a schedule that is personalized to your needs. Even better, it adjusts the schedule to make it even more personalized as it gets more information about your daily, weekly, even monthly habits as time passes. In short, this thermostat programs itself. You can also access Nest from anywhere using your mobile phone via the Nest mobile app, or on a PC connected to the Internet and adjust the thermostat anytime you want to. You can use the app to manage all thermostats at home if you opt to get one for each room, or even for thermostats located in different houses. And as for updates, there’s no need to do anything since Nest also automatically downloads and installs updates as long as it is connected to your Wi-Fi. The Nest is already available for pre-order in the US for $249 with pre-orders limited to 5 units per person. Are You a Sucker for Hi-Tech Phones? Mobile phones have made its mark as a necessity nowadays and with companies such as Nokia, Sony Ericsson and Motorola continuously tried to create alluring and innovative enhancements to their mobile units and try to outdo each other. Unlike in the early days, all that was required was a means of being able to communicate wherever they are. Then came the size of a unit after which the boom of text messaging made its mark. The capability of a phone to take pictures with built-in cameras followed suit and so on, until today where technology has totally taken its stand with regards to ideal phones by the masses. Today, the enhancements, features and different capabilities of cellular phones have made their mark to distinguish each phone from another. Flip phones, video capturing and colored screens with specific resolutions have been the talk of the town anywhere in the world. But one thing that has been totally overlooked is for a phone to be able to help in communication by anyone in the world especially when the need to be far from the people they love. So the next time you consider buying a cellular phone, think about it. Do you really need all these features or simply because people are falling for them for no apparent reason? The answer lies on how a person needs such devices, but if not, why go for such phones that are simply the same for mobile communication all the same. Wherever I go, I like making sure that I would be able to find a WiFi signal. This is especially true if I am going away for more than a day trip. Of course, it can be awkward to go around waving your laptop or whatever WiFi ready gadget just to find a decent signal. Thank the heavens for the guys at Think Geek. First the created the WiFi detector shirt. 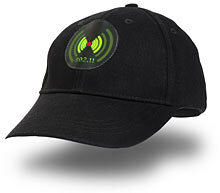 Now they have another accessory that can do the trick for any WiFi seeking dude: the WiFi detector cap. This cool gadget is the perfect juxtaposition of apparel and technology. It looks just like most any other cap that you can find at the stores. Of course, there is something different about it – there are bars on the front of the cap to indicate the strength of the WiFi signal in any given area. The stronger the WiFi signal in the area, the more glowing bars you will see on the cap. I can just imagine wearing this cap the next time I go out…no waving the iPhone around. Of course, you might have a problem if you are out alone and you want to keep wearing your cap. Since the indicator is on the front of the cap, you can’t really see the signal when you’re wearing it, right? I guess I would just have to get the cap and give it as a gift and watch the detector from there. Anyway, it’s just $14.99 at Think Geek.